Children & Youth Fundraiser - We have an ongoing cell phone and inkjet cartridge recycling fundraising drive to benefit our Children & Youth programs. There’s nothing to buy. We are simply asking everyone to safeguard the environment by donating their old digital cell phones and used printer ink cartridges. The tax-deductible cell phones and ink cartridge donations will be recycled in accordance with EPA regulations or refurbished and sold. Printer ink cartridges must not be damaged; I.e. cartridge case, circuitry, and print head must not be broken. Use zip lock bags to individually wrap each cartridge. 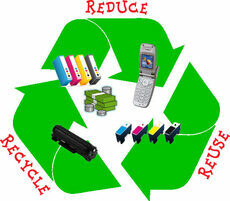 Laser & toner cartridges are also now accepted. Download a printable poster to attach to a box, which can be placed in your office or other places of employment, school, church, etc. for collecting cell phones and ink cartridges. Once filled or have at least 20 cartridges, please deliver it to the office at Winterville UMC. 100% of the proceeds will go toward our mission projects. A receipt for tax-deductible purposes will be provided for those who request one. Please email requests for a receipt, or if you have any questions.